Preheat oven to 180ºC (390ºF). Place the rum and raisins in a small saucepan over low heat and simmer until the raisins have absorbed the rum. Process butter, sugar, vanilla, cocoa, flour, baking powder, egg and milk in a food processor until a soft dough forms. Place in a bowl and stir through the oats, chocolate and raisins. 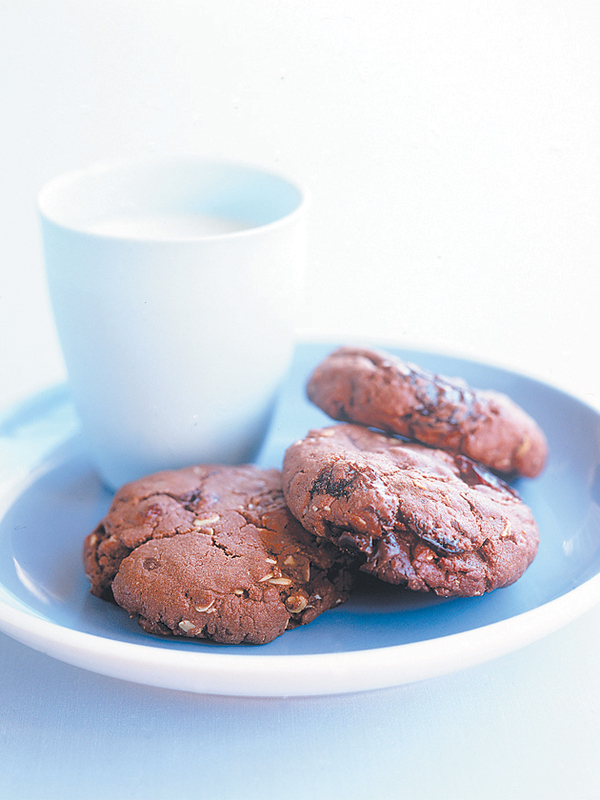 Using your hands, mould 2 tablespoons of cookie mixture into a flat round. Place on a baking tray lined with non-stick baking paper, leaving room to spread. Repeat with remaining mixture. Bake for 15–18 minutes or until the base is dark and crisp. Allow to cool on trays. Makes 15.